What’s the big-cat name for my Mac operating system? Malware targeting Apple Mac computers was inevitable – hackers couldn’t continue to ignore this popular platform where users tend to be complacent because they buy into the myth that Macs are more secure. They are not inherently more secure; they’ve just been ignored by cybercriminals… until now. 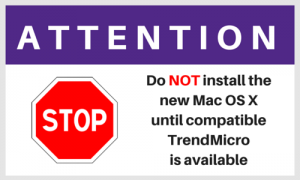 Several K-State departments have reported Mac computers infected with fake antivirus malware called MACDefender or something similar. Like its Windows scareware counterparts, MACDefender tries to trick the user into buying useless or non-existent security software for up to $99 by convincing them their computer is infected. The only thing they’re infected with is the fake AV software, and those tricked into making the purchase give their credit card information to criminals.